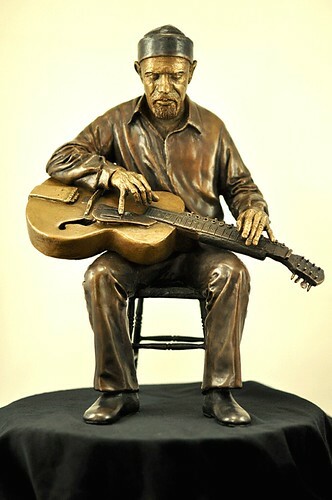 Northern Ontario sculptor, Peter Sloan, has done it again, creating a stunningly beautiful, and highly detailed bronze sculpture of well known Canadian musician, Harry Manx. Crafted with skill and expertise over a period of three years, this piece is as spellbinding as Harry�s music. The hands and fingers are poised as in play, and one can almost hear the haunting mystical melodies, emanating from the exotic Mohan Veena slide guitar resting on Harry�s lap. While watching a DVD of Harry playing, the distinctive shape and character of his hands caught Peter�s eye. He thought �They would be a good subject for a sculpture�, then he thought, �Why not the whole Harry�? Harry agreed to the idea of a bronze and met for a photo shoot at photographer John Reeves�s studio in Toronto. Reeves is no stranger to snapping photos of musicians, and his extensive resume including many of the greats such as Oscar Peterson and Gordon Lightfoot.